The Hopkinson Report » THR 214: Google Fiber – The most disruptive force since the 80s? THR 214: Google Fiber – The most disruptive force since the 80s? Reviews from the Google Fiber rollout in Kansas City are coming in, Jim compares it to disruptive Cable TV of the 80s. There are three things I remember about the cable revolution: David Lee Roth, giant spools of coaxial cable, and the waiting. It was July of 1982, and I was a 13-year-old kid living in the suburbs of Boston, Massachusetts. Back then we didn’t know any better. Entertainment consisted of 3 major TV networks and playing sports from dawn till dusk. And then the trucks rolled into town. Like some kind of kindler, gentler “Red Dawn,” suddenly cable television installation trucks were everywhere. While riding my bike in the neighborhood, I’d marvel at enormous wooden spools with endless rolls of black coaxial cableready to be strung to every household. This wasn’t a 36-inch long cable you use to connect an old VCR to your TV. This wasn’t a 100-yard supply the cable guy brings to your home in a small box when installing your DVR. 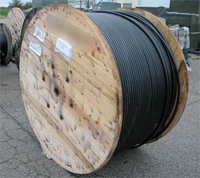 These were 6-foot tall spools with enough cable to wire an entire neighborhood. According to the National Cable & Telecommunications Association, from 1984 through 1992, the industry spent more than $15 billion on the wiring of America, making it the largest private construction project since World War II. There was a buzz around town, and best of all, my street was going to be one of the first to get this new technology installed. And then my dad stepped in. – You could watch movies on this thing called HBO. I suddenly realized the enormity of what was happening, and the wait for our new installation date to get our share of the magic seemed like an eternity. 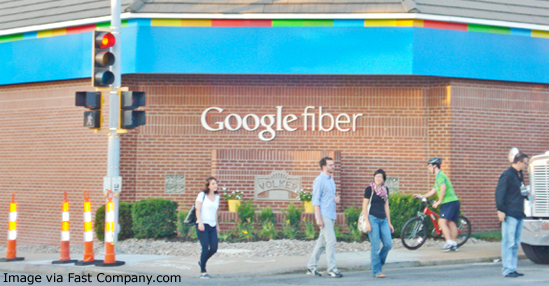 In November 2012 Google started rolling out their Google Fiber broadband fiber-optic network initiative in Kansas City, which was chosen following a competition among more than 1,000 cities. While the buzz is still early and the sample size is small, it feels to me like the kind of disruption I just described from the 80s. As early reviews come back about the speed, features, and service, the cable companies certainly have to be sweating just a bit. To be clear, various elements have been chipping away at cable television dominance for years. With the rise of the internet, everything from YouTube and Netflix to Facebook and the iPad have given us videos, movies, ebooks, games, music, and social media as an alternative to sitting in front of the television. And while many countries already have internet speeds much faster than in the US, and phone giant Verizon has its fiber optic FiOS service, it’s still brought to you by the old guard. This feels new. It’s no secret that people aren’t exactly in love with their cable company. According to the American Customer Satisfaction Index, the top four cable companies in the US (Comcast, Time Warner, Cox, and Charter) take up 4 of the top 7 spots in their Most Disliked Companies in America list. Meanwhile, an ABC News/Washington Post survey ranked Google as the most popular tech company in the U.S. And why not? Most people’s experience with them is getting instantaneous answers to web searches, maps to help them get where they’re going, and Gmail to communicate with friends and family – all without ever getting a bill to pay. When the cable company has to come to your house, it’s been a running joke for years that the best they can do is give you a 4-hour window, thus making you take off a half day of work. What’s worse, their automated phone system to remedy missed appointments has caused more harm than good. A friend that just moved experienced the system first-hand, which seemed to benefit only the cable company and annoyed him to no end. He called and made an appointment on a certain day. Fine. It’s on his calendar. Got it. But then the automated phone calls started, at least 3 of them, interrupting him almost daily and forcing him to confirm that, yes, he would be there. Then on the day of the appointment, after multiple confirmations that he would be home, he was away from his phone momentarily and missed their last automated call an hour before the appointment. The technician never showed. In one fell swoop, Google launched an attack on this practice, promising to arrive at an exact time, not within a certain window. The average person’s coffee table is littered with remote controls for the cable box, the television, DVD players, stereos, and more. 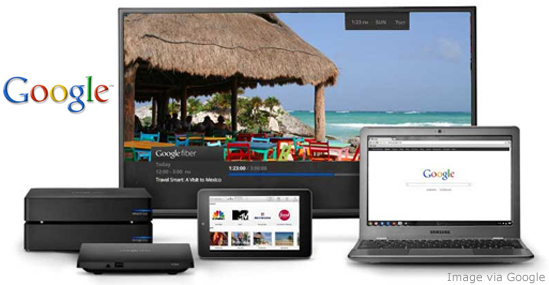 Included with Google Fiber is not just any remote control, but a Nexus 7 tablet, providing a multi-functional device with a user interface tailored to the new system and allowing you to watch TV from any room in your house. Not a bad perk. One feature is notable because it’s NOT included – phone service. It’s been amazing to see the cable companies relentlessly promote their phone service to existing users, despite overwhelming statistics. 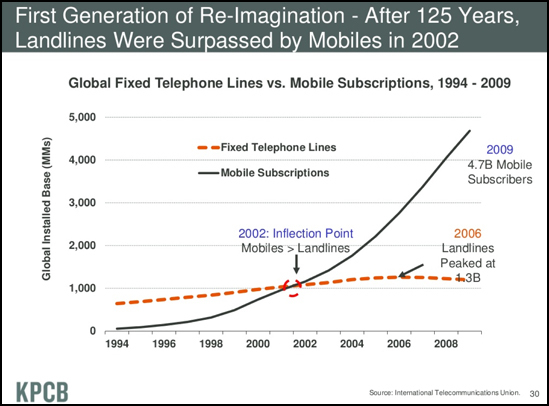 According to the International Telecommunications Union, mobile phone subscriptions eclipsed fixed telephone landlines globally ten years ago in 2002. The number of landlines peaked in 2006 and have been in decline ever since, as wireless-only homes have increased in every state and among young adults, renters, and low-income demographics. Dear Cable Companies, let me put it to you bluntly: WE DON’T WANT YOUR PHONE SERVICE! I don’t know a single person under the age of 40 that has signed up for a landline in the last 10 years. Seriously. We are addicted to our cell phones. I remember specifically the first person I knew that decided to go “mobile phone only.” It was my best friend in Seattle, and the year was… 1998!!! That was 14 years ago! Yes, I was slow in adopting a no landline lifestyle. I went “mobile only” in 2001! Google claims connection speeds of 1 Gbps, 100 times faster than broadband, with no data caps. That means bandwidth-heavy early adopters that routinely watch video and stream movies will be eager to get on board. They also provide 2 terabytes of storage for media files. As DIRECTV runs “DVR recording conflict” commercials targeted at cable TV users, touting the ability to record 5 shows at once, Google once again ups the ante by allowing 8 shows at once. The most interesting option from Google Fiber might be the free internet package offered at slower download speeds (5Mbps). After an initial installation fee ($300 one-time or $25/month for one year), they guarantee free internet service for at least 7 years. Additionally, users can purchase a cloud-based Chromebook laptop for $249, a price within reach for those unable to drop $1000+ on a Macbook Pro. So how did the first revolution end up for me? Eventually a 20-something cable installer with a mullet showed up at our house to set everything up. As I looked on, he grabbed the remote and immediately turned to MTV, where I saw my first music video. “That’s Van Halen, you know,” he said rather proudly. It might take many years for Google Fiber to come to your city. As the service grows, perhaps they’ll suffer from the same customer service issues plaguing the cable industry. And before long, 1 Gbps speeds and 2 terabytes of storage might seem as outdated as a music television station that actually plays music videos. But somewhere near Kansas City, there’s a 13-year-old kid that will be waiting. Sponsor Message: Freshbooks Fresh Take of the Week: December. Interestingly, two different high profile bloggers that I follow covered the same topic in their newsletter last week… as the rest of the world chose to wind down in December and relax, they are doing the opposite – doubling up on work while everyone is resting and thus hitting the new year in stride. Ironically, this is the same tactic I plan to take. My plate is already pretty full with writing, teaching, and some new proposals, and now I have to decide about a major project. Will I have the time? I haven’t made up my mind 100%, but I know the answer will be yes. My plan? Over the next 18 days, work 6 days per week and be incredibly focused from 8am to 6pm, taking Sunday as a rest day to watch football. At night, I have 6 teaching gigs, 5 holiday events, and will fill out the remainder with rest and other social activities. To be honest, I can’t wait to get started. How about you? Will you be slowing down or speeding up in December? One way to keep a good schedule and be efficient with your time is by managing your billing using Freshbooks. This entry was posted on Sunday, December 2nd, 2012 at 12:24 am and is filed under Marketing Case Studies, Pop Culture / Entertainment, Product Reviews, Social Networking / New Media, Workplace Trends. You can follow any responses to this entry through the RSS 2.0 feed. Both comments and pings are currently closed.